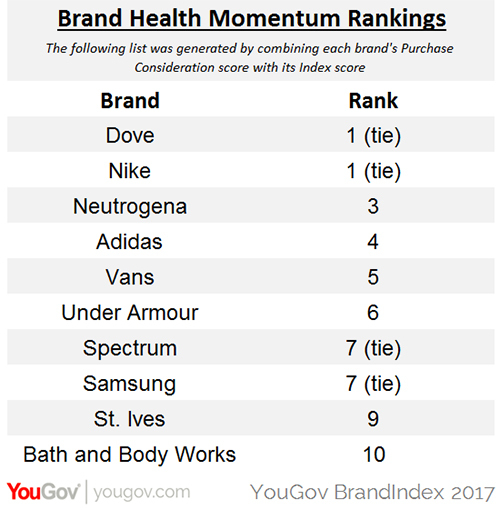 The top brands which combined the largest brand health gains with increased purchase consideration across 2017 mostly fell into two distinct retail categories: athletic wear and beauty and cosmetics, according to YouGov BrandIndex’s first Brand Health Momentum Rankings. These new rankings offer a powerful, comprehensive insight into the brands that not only “walked the walk” with consumers in 2017 but most likely profited from it too. Dove and Nike tied for first place. Other athletic wear brands in the top 10 include Adidas, Vans, and Under Armour. Cosmetics and beauty brands that made the cut include Neutrogena, St. Ives, and Bath and Body Works. The two brands which didn’t fall into either of these categories are cable provider Spectrum (the new name from the Time Warner Cable and Charter merger) and electronics giant Samsung. These 10 are the brands which accomplished the best of both worlds in 2017: they grew their share of potential sales revenue in their respective categories, while increasing positive consumer perception for their brands across multiple factors.